What’s the first stat of the Rocket/Sticky Jumper that pops into your head? Probably -100% damage. But it turns out that these weapons have actually had a number of ways to bypass the restriction and deal the damage in weird ways. Some are fixed, some are not, all are here for your reading pleasure. Despite what basic arithmetic would tell you, MVM is not one of them. 1. The Rocket Jumper could once hurt enemy Pyros: Who airblasted the rockets. This is probably the most famous one on this list. Supposedly this was fixed at some point, but it was never mentioned in any update patch notes so I didn’t notice when. 2. The Sticky Jumper could once hurt everyone. It was freaking awesome. 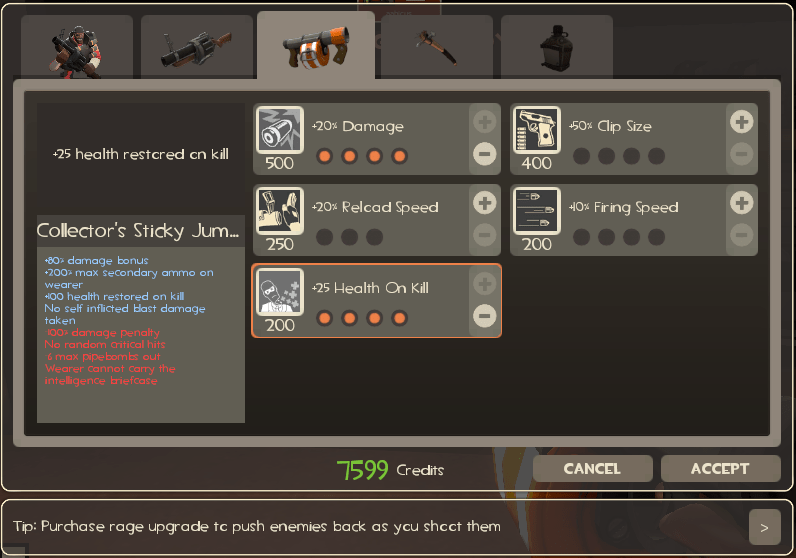 For less than 24 hours after it came out during Scream Fortress 2010, the Sticky Jumper had no damage penalty whatsoever except against the Demoman who fired it. This includes his teammates. Personally I blame it coming out at the same time as the neutral Headless Horseless Horsemann, but Valve very quickly put the kibosh on the Win/Losebomber. 3. Both Jumpers could once damage the player who fired them. For a while, if you wanted to fire the Rocket/Sticky Jumper and retain the only real upside to using it, you had to make sure not to switch weapons because the self-damage immunity only applied while the jumper was the active weapon. This got fixed in the September 15, 2011 update. 5. Vaccinator used to treat Jumper self-damage as legit self-damage. You know how the Vaccinator heals the Medic if his pocket takes damage (including self-damage)? Well, for some time if a wounded Medic with the Vaccinator set to ‘explosive damage’ healed a Jumper who hit themselves with their harmless Jumper projectiles, they’d get the full heals even though their pocket took no actual damage. Since the Vaccinator stat was based on MvM upgrades, I have to assume that some Valve update that messed with those was responsible for this no longer working. So is there any decent way to get actual kills with the Jumpers? Yes, actually, there’s exactly one! 6. Win a taunt duel! Pay attention to the killfeed the next time you defeat an opposing player in a high-stakes game of Rock Paper Scissors. It assumes the killfeed of whatever weapon you were holding at the time. Like any other irregular weapon you’re holding, you get the generic skull-and-crossbones death icon, but that still means your beloved Jumper racked another notch on its barrel. What’s that? You were hoping for a way to get legitimate kills in a more credible battlefield situation? Equip a real Rocket/Sticky launcher then.